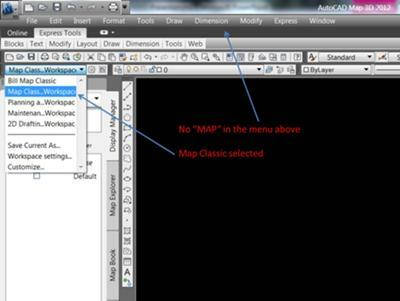 I have AutoCAD 3D Map 2012. When I switch to Map Classic Workspace the Map dropdown menu is missing. All the other dropdown menus are there e.g., File, Edit, Insert Format etc. Any ideas how to get it back? the map menu is missing because it's not part of the workspace that you just switched to. You must load it to this workspace. to do so when you hit the pull down in your work space toolbar there is a customize option. 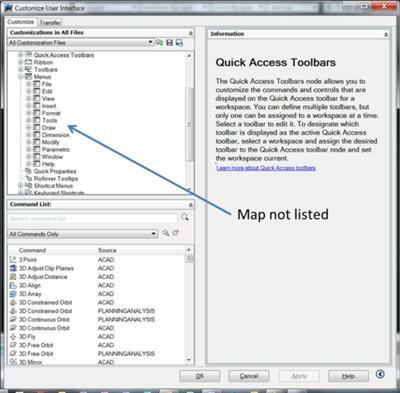 this is where you must go to add the map to the desired workspace and then save it to that workspace. after doing this I would close out of the session and reopen. good luck.